The summer wine releases keep on coming at Vintages. The release Saturday features three wonderful whites that all fit nicely beside the pool, on the front porch or dockside at the cottage. Lakeview Reserve Sauvignon Blanc 2011($17, Vintages, 87 points) — A nose of tropical fruit with touches of gooseberry and fresh herbs. It’s clean and flavourful on the palate with tropical-citrus fruits and a dab of passionfruit. Balanced out by nice acidity. Fielding Estate Pinot Gris 2011 ($22, Vintages, 88 points) — Fielding has the most complete Pinot Gris program in Niagara. It now has three tiers: Rock Pile, the “Estate” Pinot Gris, and the entry level Gris. This Estate Gris is gorgeous with a nose of poached pear, peach and tropical fruit. It’s lush and fruity on the palate, with broad and succulent flavours and a citrus kick on the finish. 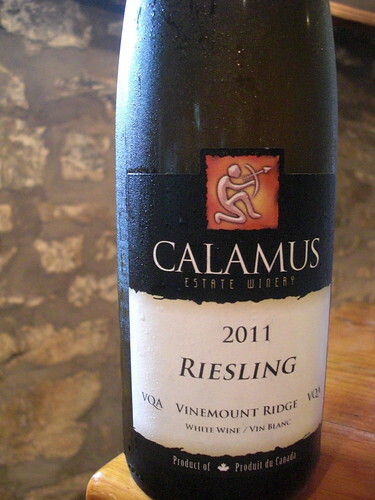 Calamus Riesling Vinemount Ridge 2011 ($17, Vintages, 90 points) — It opens with gushing grapefruit and lime aromas with softer notes of peach and river rock and a subtle note of earthiness. It bursts on the palate with a wave of citrus fruit, racy acidity, quince and minerals. It’s a very focused wine that will develop and mature, bringing petrol and minerals in balance with the fruit. Calamus Cabernet Sauvignon 2009 ($20, Vintages, 88 points) — Good aromatics of blackberry and cherry fruit with a touch of cassis, oak and spice. It’s juicy in the mouth with supporting tannins, oak, spice and a persistence that lasts through the finish. Coyote’s Run Pinot Noir Rose 2011 ($15, Vintages, 87 points) —Here’s a rose that’s perfect to have around for backyard entertaining. The nose shows cherry fruit and fresh strawberries. It’s refreshing on the palate with meaty red fruits, a touch of cassis and plenty of vibrant acidity. Great sipping rose that would also work with light summer foods. 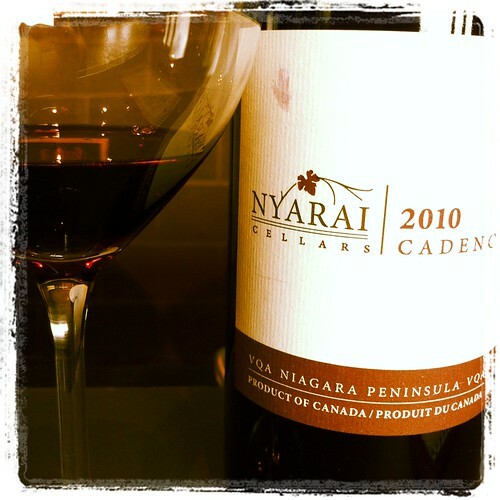 Nyarai Cellars Cadence 2010 ($20, web and DiProfio Winery, 90 points) — Steve Byfield, a virtual winemaker now crafting and selling his wines at the DiProfio Winery in Jordan Station, likes to let the fruit do all the talking in his wines, and, in a ripe vintage such 2010, his reds do a lot of talking. He blends his beloved Syrah with Cabernet Franc, Cabernet Sauvignon and Merlot and ages it in older French oak barrels for 15 months. Syrah dominates on the nose with spicy currants, blackberry, black cherry and integrated oak spices. It is, as Byfield says, a “fruit bomb” in the mouth with ripe raspberry, cherry, cassis followed by pepper and light oak-spice flavours. I enjoyed this with a nice pulled pork slider and it worked beautifully. A great wine, especially at this price. Reif Estate Baco Noir 2011 ($15, winery, WineSplash.ca, 88 points) — A beefy Baco with tar, leather, smoke, licorice, plums, dark chocolate, currants and oak aromas. It comes together nicely in the mouth with layered flavours of dark fruits, oak spice, black licorice, and smooth, soft tannins. Reif Estate Chardonnay Reserve 2010 ($22, winery, WineSplash.ca, 89 points) — Notes of poached pear, sweet vanilla and spice, apple, toast and white peach on the nose. It’s tasty on the palate with ripe apple-pear fruit, butterscotch cream and a balanced approach to the spices. Reif Estate Chenin Blanc 2011 ($19, Winery, WineSplash.ca, 88 points) — One of only a few making Chenin in Ontario. The nose shows pretty honeysuckle, cantaloupe, apple, white flowers, apricots, and tropical fruit. It’s an off-dry style yet fresh and lively with ripe tropical and apple fruits in a clean finish. Reif Estate Vidal Late Harvest 2011 ($16, Winery, WineSplash.ca, 87 points) — A sweet nose of tropical fruits, honeycomb, and apple pie. It’s not overly sweet in the mouth with deliciously ripe baked apple, cinnamon, candied tropical fruit, honey and peach compote. Good acid through the finish. Lakeview Cellars Riesling Reserve Roller Vineyards 2011 ($17, winery now, Vintages Sept. 15, 91 points) — Such a unique Riesling with a nose of MacIntosh apple, Asian pear, citrus, mineral and gorgeous white pepper-ginger spice. It’s crisp and bone dry on the palate with bracing acidity and weight (considering it’s a Riesling). It shows juicy apricot, apple, ginger and lovely minerality. Delicious.